It’s nearly time for Mount Royal Conservatory’s next Wyatt Artist in Residence Concert Series performance. The Assad Brothers are performing Nov. 9. Tickets are available now. The Brazilian-born classical, Latin and jazz infused Assad Brothers aren’t just treating their Calgary audience to an unforgettable concert: they’re here to instruct our Academy for Gifted Youth Guitar program as part of the Wyatt Series. 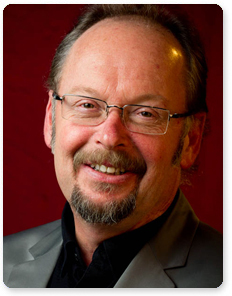 Murray Visscher, Mount Royal Conservatory Academy for Gifted Youth guitar program co-coordinator. And the students are in for the masterclass of a lifetime, says Murray Visscher, Academy program co-coordinator and ensemble coach. “I remember first hearing the Assad Brothers while I was in university. They had recently released the album, Latin American Music for Two Guitars, and they were coming to perform in Vancouver. The concert was amazing. They were fast and fluid with effortless ensemble, filling the room with their contagious passion for the works that they played,” said Visccher, who received his Masters Degree at the San Francisco Conservatory and has performed for audiences in major North American cities. Sérgio and Odair Assad have set the benchmark for all other guitarists by creating a new standard of guitar innovation, ingenuity and expression. The Assad Brothers are setting new performance standards and are playing a major role in creating and introducing new music for two guitars. The Assads have worked with renowned artists Yo-Yo Ma, Nadja Salerno-Sonnenberg, Fernando Suarez Paz, Paquito D’Rivera, Gidon Kremer and Dawn Upshaw. 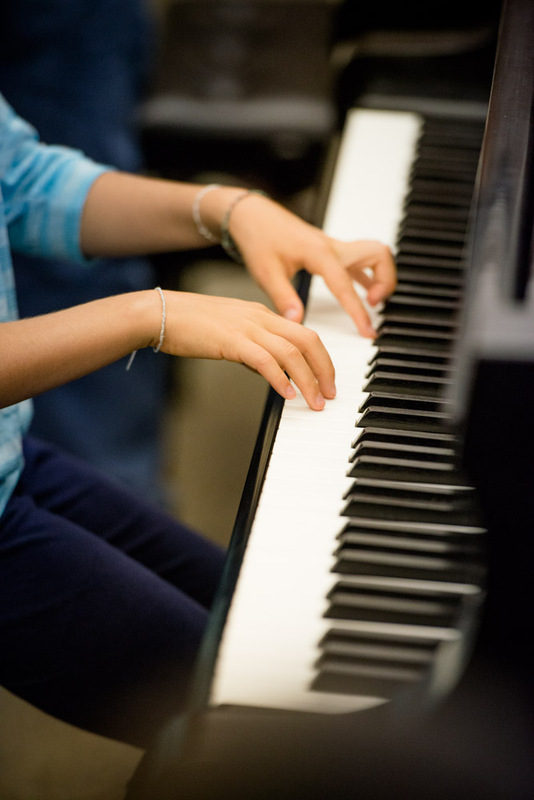 Mount Royal Conservatory’s Academy Program for Gifted Youth began in 1980 and is an enrichment program providing musical training of the highest quality for gifted young artists. 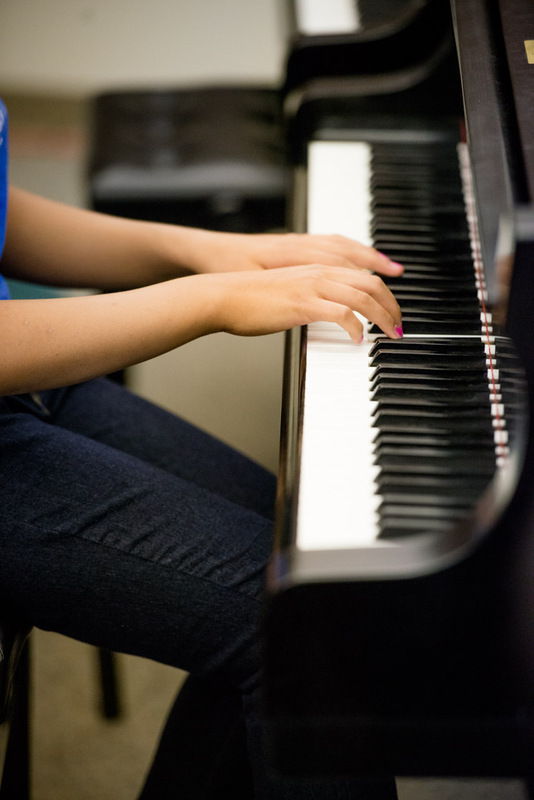 The Academy Program offers participants a balanced, performance-based course of study, as well as opportunities to meet and perform with professional musicians and renowned teachers. Specific training includes sessions with acclaimed musicians in private lessons, small group classes and masterclasses; individual sessions with an accompanist; chamber music coaching; instruction in theory, aural skills and musical discoveries; frequent recitals aimed at developing confidence and stage presence; and participation in a large ensemble for those students who play orchestral instruments. DID YOU KNOW? The Wyatt Artist in Residence series honours Hal Wyatt and his late wife Marnie, long-time friends and supporters of the Mount Royal University Conservatory. Ding dong, it’s the carillon: Mount Royal University is among the few Canadian campuses to feature a bell tower that chimes on the hour and plays music. A live concert is planned Oct. 27 at noon. 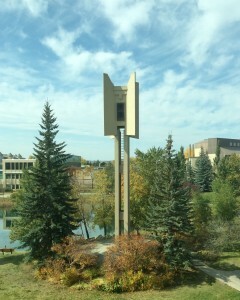 When you’re running late to class or to a meeting on campus, Mount Royal University’s carillon always lets you know. Mount Royal is among the country’s only campuses with a digital carillon (with its 51-bell Soldier’s Tower, the University of Toronto is the only Canadian university with a true, bells-only carillon). And you can bet Mount Royal may be the only Canuck campus carillon that plays the theme from Star Wars. 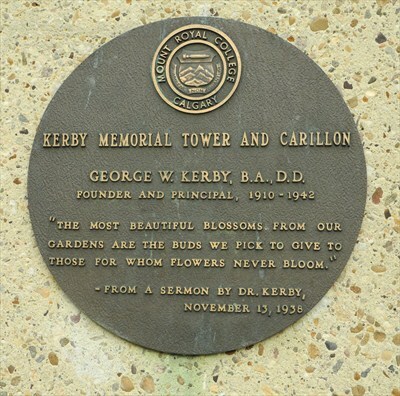 The 60-foot high Kerby Memorial Tower and digital carillon chimes hourly between 9 a.m. and 6 p.m. It plays four songs daily: two at noon and two at 6 p.m. With 50 songs in its repertoire, which shuffle and play at random, it takes two weeks to run through them. The repertoire is largely classical, but a keen ear will pick up familiar tunes including The Entertainer, Cabaret, New York, New York and Send in the Clowns. 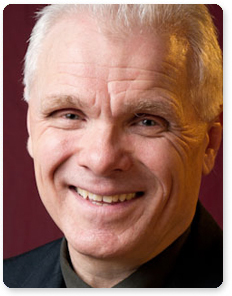 Mount Royal Conservatory head of organ studies Neil Cockburn is the university’s offical carillonneur. 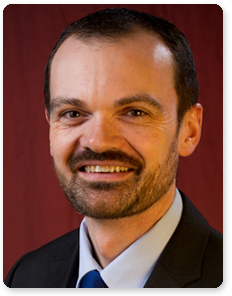 “I always find it quite relaxing, it brings something special to campus,” said carillonneur Neil Cockburn, Mount Royal University Conservatory’s head of organ studies. 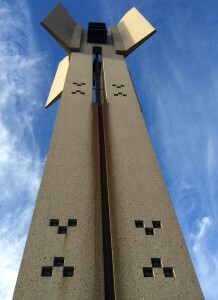 Cockburn helped the carillon find its voice again – after falling into silence over the years, the digital bells returned in the mid 2000s. MRU’s 2010 centennial marked the start of daily chimes and tunes, thanks to Cockburn, who programs it to play. 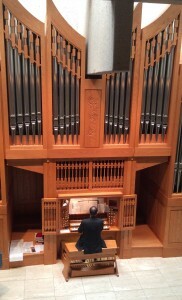 He performs live during convocation. 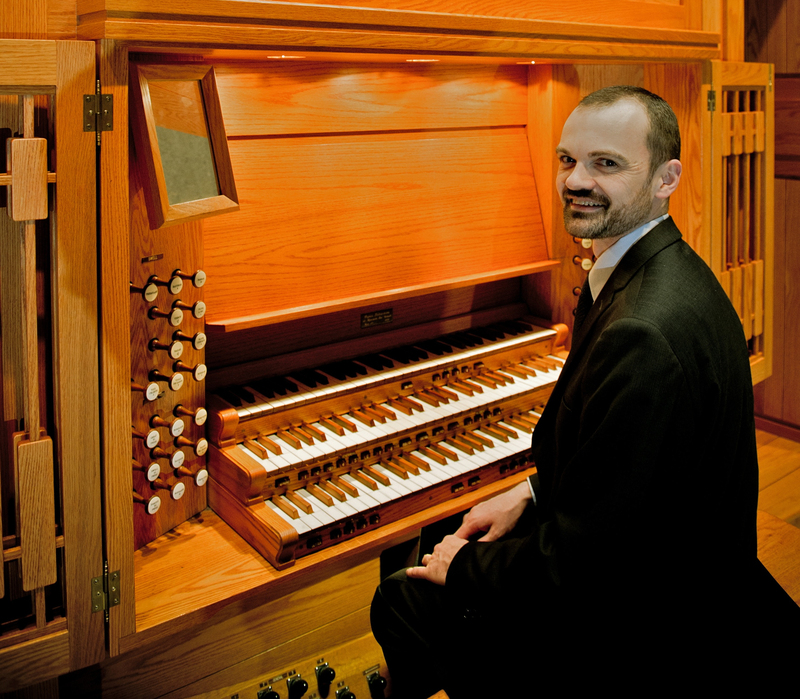 Cockburn also hosts a free live Carthy organ concert in Wyatt Recital Hall on the second Thursday of every month. Cockburn is performing a free, live outdoor carillon concert Monday, Oct. 27 at 12:10 p.m. as part of the Calgary Organ Festival. The open air event is audible around campus but the best seats in the house will be listening from the TransCanada Amphitheatre at MRU’s Charlton Pond. 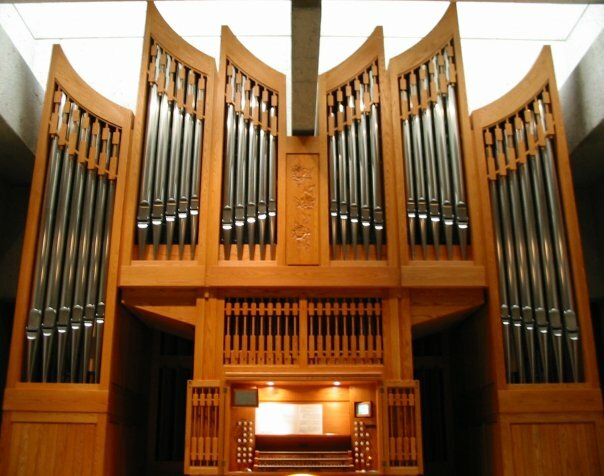 The carillon can either be played live using a keyboard in the programming booth of Wyatt Recital Hall or automated using a memory card. 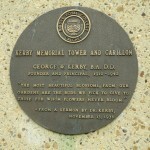 Kerby Memorial Tower and its carillon was officially unveiled in 1972 — when the Lincoln Park campus opened — to honour founder Dr. George W. Kerby. Reportedly, the carillon can be heard over a four-mile radius, making its broadcast the true voice of the university and part of Mount Royal’s architectural identity. The same company salesman that sold Mount Royal the original carillon — Schulmerich Bells’ John Nelson in 1969 — also provided the centennial upgrade to digital. Now that’s service! Last Christmas, @MountRoyal4U used twitter to encourage the student body to tweet carol suggestions. Carillonneur Neil Cockburn played Up on the Rooftop during the Conservatory’s Treble and Truss roof raising of its new building. The bell tower was designed to age quickly so it looks like it’s been around forever: the speaker boxes are made out of weathering steel that rusts in the rain, washing down and staining the concrete. The bell tower’s peak inspired the design of Mount Royal University’s current logo, which takes its cues from the triangulated, diagonal shapes seen in campus architecture, including the East Gate, the West Gate, and the peak of the carillon. The carillon plays eight different chimes, including the famed Westminster Peal from Big Ben, Winchester, and Lord Tennyson. Other bell voices include True Cast, Flemish Bells, Harp Bells, English Bells, Celesta Bells, and Organ Chime. The bell tower originally contained 147 miniature bronze bell units which were struck by metal. By definition, a true carillon must have at least 23 bells — any fewer and the instrument is considered a chime. 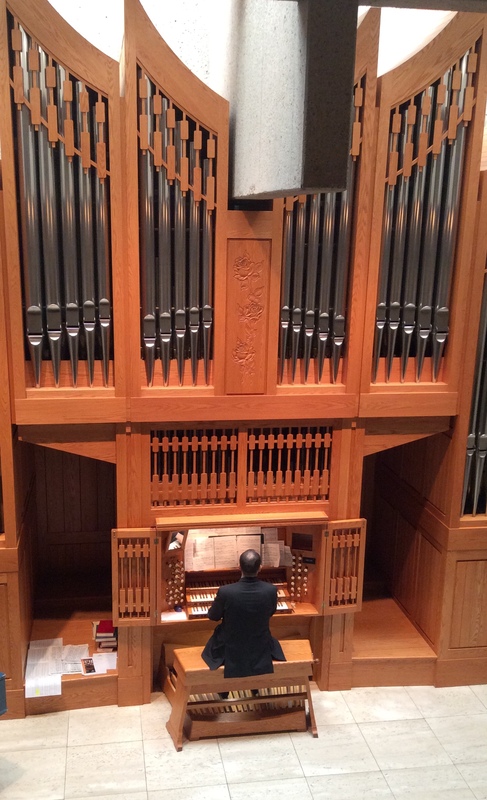 Mount Royal University Conservatory’s Carthy Organ is a real beauty. 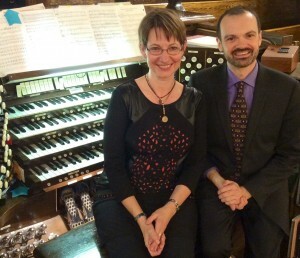 Recitals are planned city-wide for the Calgary Organ Festival Oct. 24-Nov. 2. Internationally-acclaimed performers, free campus concerts and a Halloween night silent film screening set to live music are in store for audiences of the Calgary Organ Festival and Symposium Oct. 24 to Nov. 2. If you’re new to it, the 10-day festival is filled with recitals around the city, a symposium , a hands-on workshop and worship services. And since Calgary is said to have the highest number of pipe organs of any city west of Toronto, it seems fitting to show them off. This marks the fifth year for the festival, which is organized by Mount Royal University Conservatory. 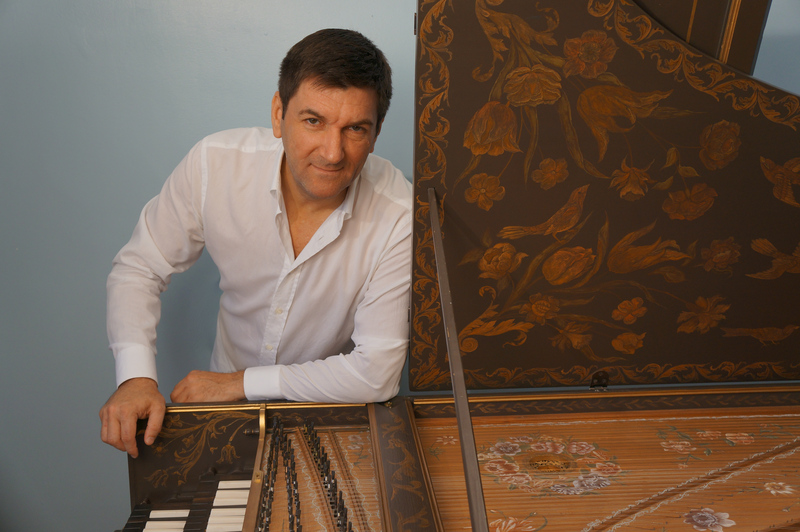 Recitals around the city include performances by international recording artist and early music specialist Luc Beauséjour (Montreal), and multi-international competition laureate and silent film specialist David Baskeyfield (UK/USA). 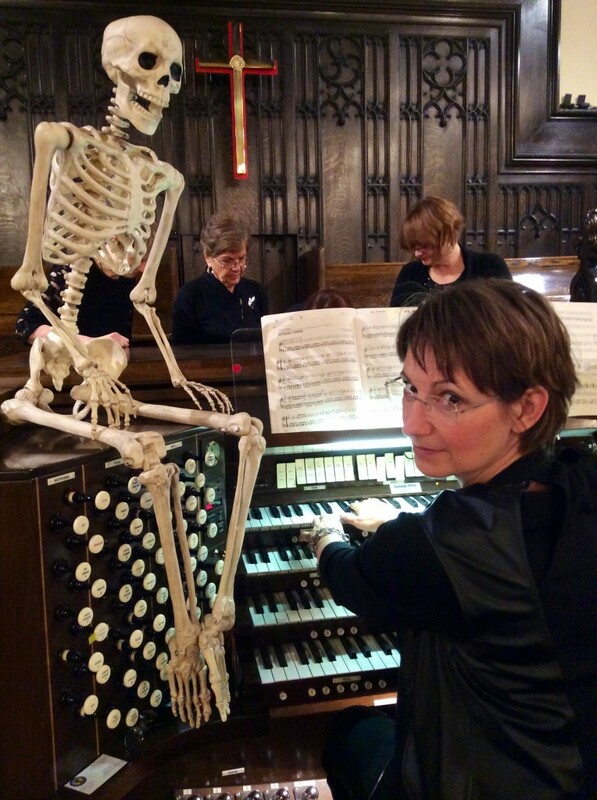 Halloween night will be celebrated in style at the Great Halloween Organ SpookTacular, featuring a screening of the 1925 silent movie Phantom of the Opera set to live pipe organ accompaniment at Knox United Church. Baskeyfield is increasingly renowned for silent film accompaniment; besides Phantom, he’s created music for Nosferatu (1922). 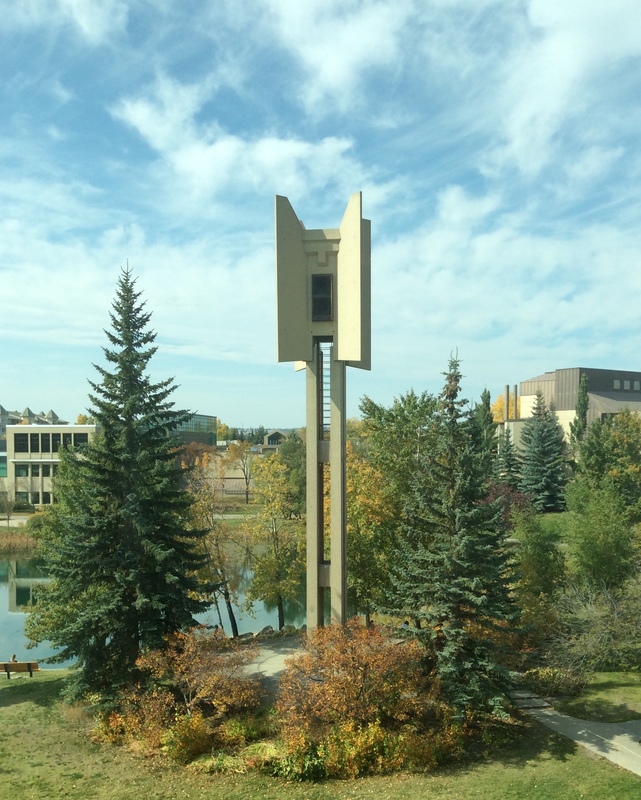 Here on campus at MRU, there is a free, live outdoor carillon concert Oct. 27 at 12:10 p.m. The open air event is audible around campus but we recommend bringing a blanket to sit on and listening from the TransCanada Amphitheatre by MRU’s Charlton Pond. And if you’ve never visited the Conservatory’s Wyatt Recital Hall, home to our stunning Carthy organ, there’s a free recital Thursday, Oct. 30 at 12:10 p.m. Francine Nguyen-Savaria will be performing the organ music of Johannes Brahms (1833-1897). The full festival schedule is available online. People are still talking about Inuit throat singer Tanya Tagaq’s Polaris Music Prize gala performance last week. But take a closer look on stage: that’s violinist Jesse Zubot. Did you know he got his start taking lessons from our Academy for Gifted Youth manager Bill van der Sloot? 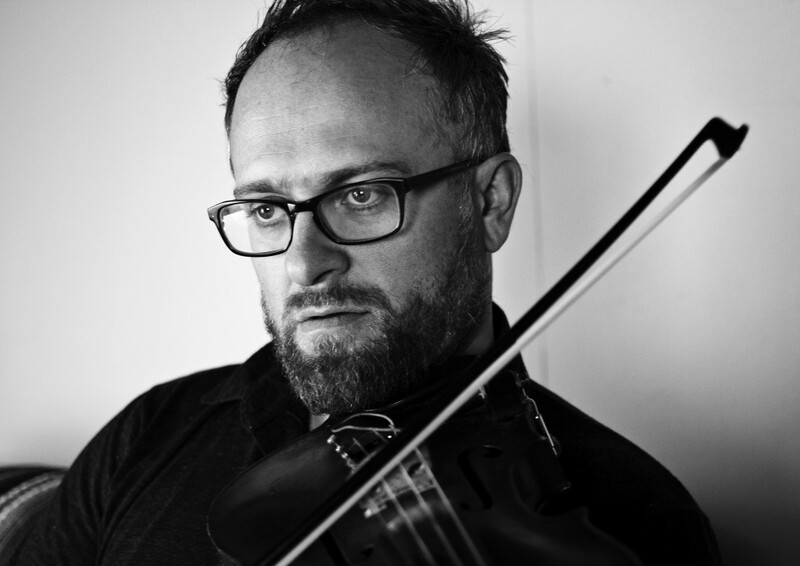 Zubot began playing violin at age four and studied with van der Sloot until he was 16. Zubot, who now calls Britannia Beach, B.C., home where he runs the critically acclaimed creative music label Drip Audio, is part of three Juno Award-winning acts: the acoustic-roots ensemble Zubot & Dawson, The Great Uncles of the Revolution and Fond of Tigers. 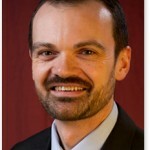 He came back to the Conservatory as a guest artist for the Academy a few years back. We caught up with Zubot to learn more about his Conservatory experience. Jesse Zubot: One of the best things I got through the teachings from Bill was learning very clean and precise technique. This saved me a lot of time once I became a professional musician. As an adult musician, I could concentrate more on composing and creating exciting performances instead of having to spend all my time keeping my playing together. Question: Your incredible work with Tanya Tagaq was a joy to hear and to watch during the Sept. 22 live performance at the Polaris gala. What do you think audiences took away from your performance? What was the experience like for you? Jesse Zubot: I think the audience at the Polaris took away that it’s OK to be musically free… I think they may have sensed some form of spiritual awakening almost. Working with Tanya is all about being in the moment and letting the music guide you. We pretty much do 100 per cent improvised performances so it is very real and can even be overwhelming for some listeners as we aren’t afraid to raise the roof with extreme volume or intense emotions. Hopefully the Canadian music industry will be more open to supporting more artistic live musical performances in the future at award shows. The experience was great for me. It was good to actually really do what we do instead of conforming to an arranged piece of music that is the same as the actual recording, like most others did. It felt great to get some recognition for our work. We’ve been touring hard for the last six or seven years. Question: Looking back, what was the best advice you received as a young musician that you carry with you today? Jesse Zubot: I would say having fun and being committed is very important. If you make the decision to be a musician you really have to honour that decision and go for it 100 per cent. It can be a hard life, but if you give it all you got, you will be rewarded greatly.